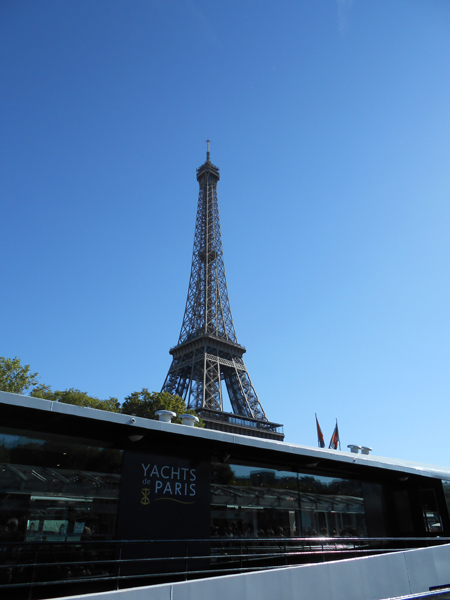 Bateaux Mouches and Bateaux Parisiens are two of the popular options for boat trips along the Seine. I had tickets for Bateaux Parisiens and it was a perfect day for a river cruise. As the Seine flows through the centre of Paris, a boat tour actually covers a great deal of the city. We passed many interesting and famous sights but I quickly learned that in order to get any decent photos it would be necessary to have a seat along the outside of the boat. In order to get these seats, which were not under cover, it would have been necessary to have been at the front of the not insubstantial queue. We were inside, in a row of seats with a huge Perspex roof above us which not only interrupted all potential photos but also meant that it was sweltering hot with the sunlight pouring through. There were headphones with a recorded commentary which seemed to be very informative but I must admit that it was not long before I hung them back on their hook and sat back and decided to just soak up the sights and atmosphere in relative peace. Our boat was huge; holding nearly 600 passengers. It was a good way to get one’s bearings in the city and we were able to see many famous monuments in relation to each other but I did notice, en route, that there was a “batobus” which allowed travellers to hop on and off at each stop. I think in the future I would choose this as it was a bit frustrating knowing that we had to wait until the end of the hour long cruise before we would be able to retrace our steps to explore further. There are various options for cruising along the Seine with several companies (Bateaux Mouches being the oldest and most well known) and many companies offer lunch and dinner cruises as well. Most boats are also equipped with lights to illuminate landmarks in the evening. I was glad that I had been on a boat on the Seine and would certainly recommend it as an experience for anyone on their first visit to Paris. The part that I enjoyed the most was just watching people going about their everyday lives along the banks of the river. There were many people sunbathing on this beautiful September day; children playing; couples walking hand in hand; people cycling on their rented “Velib” bikes (free for the first 30 minutes) and people living on the many, colourful barges moored up on the banks of the Seine. I couldn’t help but think that a barge would be the perfect way to enjoy the river and its sights. Somehow the river’s grandeur and the magnificence of its sights coupled with the relaxed way of life demanded something less crowded, less touristy and slower paced.